Lyn Aylward’s paintings are concerned with the human figure, portraying people from different backgrounds, in both figurative, narrative works and more traditional portraiture. 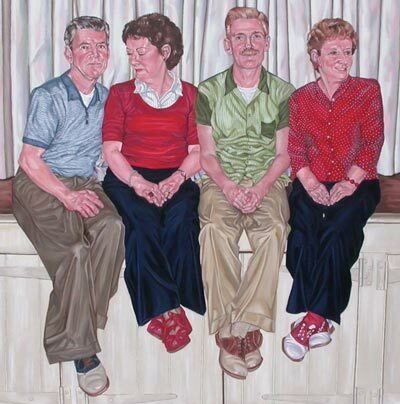 Her distinctive, realist paintings also explore human relationships, family ties and recollections of childhood. Take five with… is an ongoing series of informal interviews with Artworks artists. 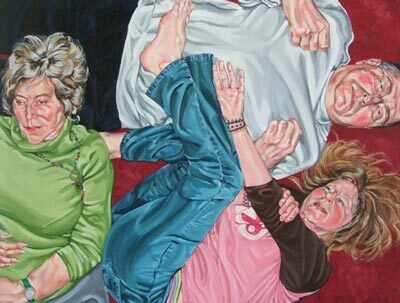 Without further ado, let’s ‘take five‘ with the figurative painter Lyn Aylward, who is a new member of Artworks. Which person most encouraged you to first become an artist? My mother first encouraged me. 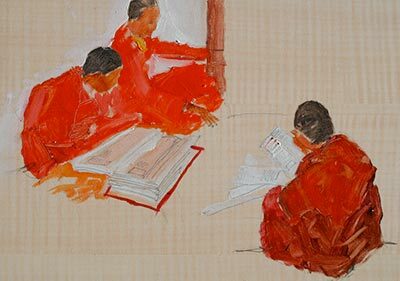 She studied to be an art and history teacher at Southampton during the 1960s and had (and still has) a wonderful sketchbook that she worked in that is filled with portraits and figurative studies of her room mates and friends during her time there. I have always wanted to have a sketchbook that was half as good as hers and I definitely haven’t managed it yet! 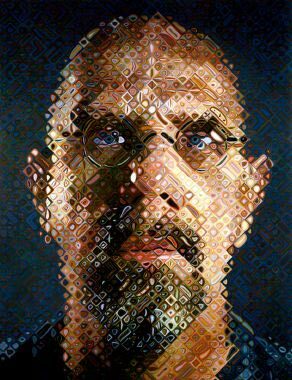 Chuck Close, whose work is beautiful and for bringing the portrait back into fashion when it was no longer considered to be a modern art form. He is an inspirational artist who comes up with gems such as ‘problem solving is way too overrated‘. 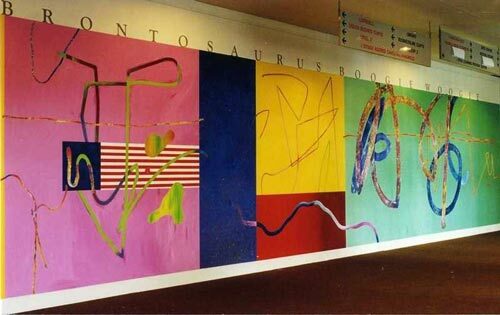 ‘Problem creation is much more interesting‘ and painting is ‘coloured dirt smeared on a flat surface, usually stretched around some wooden sticks‘. 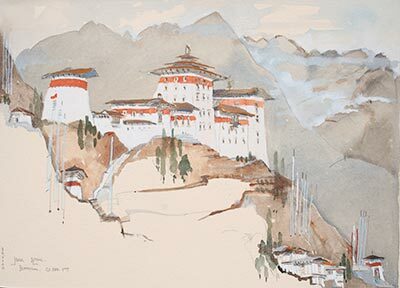 Whereabouts in the world is (or has been) the most inspiring location for you as an artist? 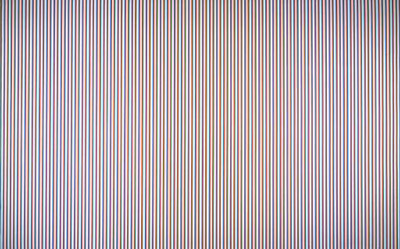 I visited the Metropolitan Museum of Art in New York in 2009 and I have to say that when I walked into the room that housed the Chuck Close, Andy Warhol and Alex Katz works I found myself in heaven. 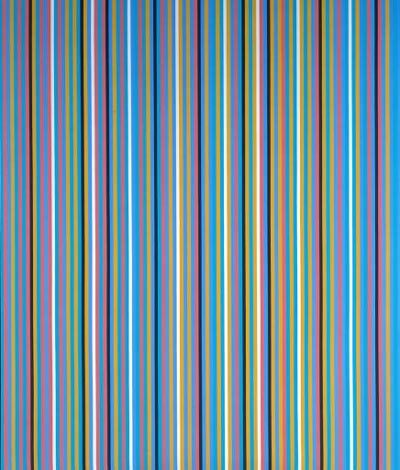 I was on holiday with my cousins and they had to sit and wait for me for at least quarter of an hour whilst I stood in front of the Chuck Close ‘Lucas’ painting alone. There are many fantastic works of art in the museum and I really would like to go back and spend a lot longer there. My cousins presented me with a printed bag after the trip which includes a photograph on the front of me standing in front of the ‘Lucas’ painting. I obviously stood there for what seemed like ages to them but nowhere near long enough for me! What do you listen to while creating – music, a radio station, or do you work in silence? I am a huge fan of all types of music so often have music playing when painting. The type of music depends on what I am working on at the time. I mostly listen either to a classical film soundtrack or classical music as it is the only way to stop me singing along to songs and losing my concentration! Or it has to be something sung in a different language to keep me from joining in or an audio book – usually Agatha Christie. The golden rule for me is to NEVER put anything on that can be danced to as that just leads to some very dodgy dance moves and some shaky painting! How do you generate or develop ideas for your art? I tend to scribble ideas on bits of paper and I do have an ‘ideas’ book that I paste into any scribbles, photos or pictures that I think might inspire me at some point. I am inspired by other artists, photographers, film, books and often the people around me so ideas can spring from anywhere. Could you describe your art studio set-up. One room, no running water, no heating and the scariest steep staircase but it has wonderful big windows so excellent light. Brilliant in the summer but freezing in the winter! What time in the day are you at your most creative? Definitely during the morning and the worst time is during the evening. What is the purpose of drawing for you as an artist? Drawing is incredibly important for me. I always begin paintings with preparatory sketches. I never go straight to the canvas. Plus I think that even if my sketches are not brilliant, they have helped me to really look at my subject so that when I get to the stage of working on canvas I have already got a good feel for the subject/sitter. Is there an art medium/technique you’d most like to try but haven’t yet? I have never tried etching and I would love to try this as I like the idea of being able to have more freedom to draw than some of the other printing methods. I have only printed using lino, lithography and collagraph to date. If you had to choose between using a pen or a pencil – which one and why? I would always choose a pencil. The way that you can make different marks with a pencil is the reason why. Plus you can start a sketch using very light marks so that you are able to correct any mistakes and I find that a pencil enables me to give more tone than ink. 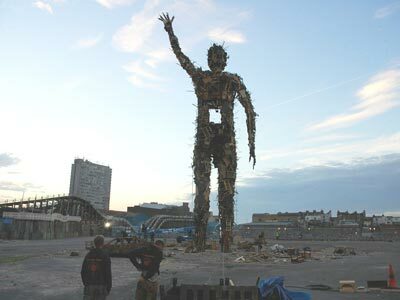 I heard Antony Gormley say this in a TV documentary and I have stolen it for my own motto! It is on the back of an envelope and pinned to the wall in my studio. It is ‘what is worth doing, do it completely and tell it like it is‘. In addition to being a new artist with Artworks in 2011, Lyn Aylward is also an active member of the Norfolk artists group Breckland Artists. 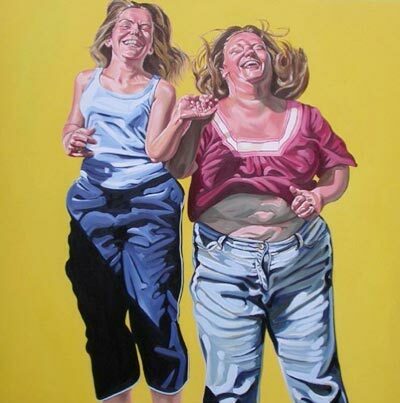 She exhibits her work at a number of galleries throughout East Anglia and also accepts portrait commissions. This entry was posted in artworks news and tagged artist interviews, artists, artworks, figurative, lyn aylward, paintings, portraits on August 4, 2011 by admin. 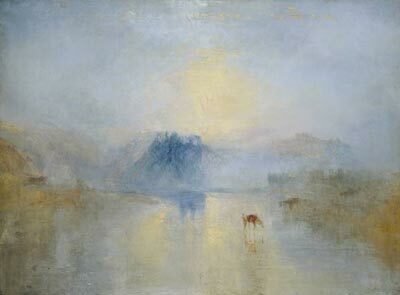 Nature, landscape and the environment seems to be a strong theme in much contemporary art. 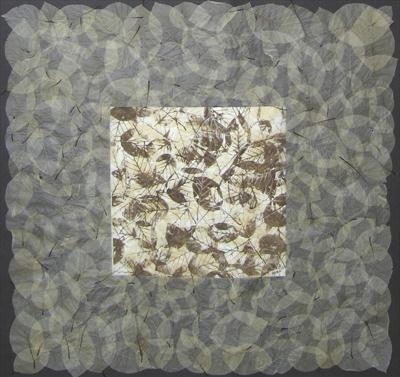 In your own work, you use natural materials such as beech leaves to create handmade paper which you then use to print on. 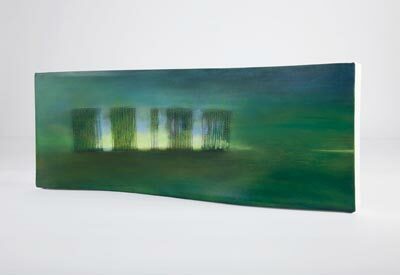 Are there any contemporary artists that you particularly admire? 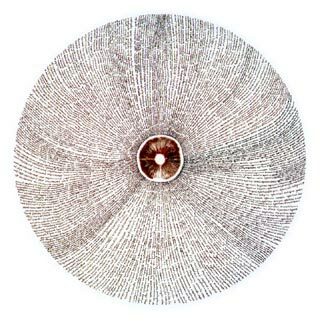 Environmental artists like Chris Drury, Richard Long and David Nash most interest me because I share the desire to work with the available materials in the environment. My ideas often come from unexpected sources. A few years ago I joined a group of London artists in an exhibition in Bethnal Green. The common theme among the group was ‘earth’ and I decided to look at satellite images to see what earth could be seen in the area of the gallery. This sparked a continuing fascination with aerial views. Other ideas simmer away for years, occasionally rising to the surface but never quite resolving in to finished work. Could you describe your art studio? My studio space is a converted garage. It is full of bags and buckets of leaves and fibres in various stages of papermaking production. I have a small table top printing press which is good for small work and for working through ideas. For larger work I go to Gainsborough’s House Print Workshop which has a wonderful range of printing presses. I like to plan a piece of work and make the paper in my studio at home and then produce the finished print at Gainsborough’s House. What do you listen to while working in your studio? Turning the radio on to Radio 4 is part of the ritual I go through as soon as I enter my studio, along with lights, heater, overall etc. Whether or not it stays on depends on what I’m doing. If I’m preparing paper or clearing up ink I like to listen but as soon as I’m doing something creative I turn the radio off. In a typical day I never seem to hear a whole programme. I am always up early and most creative in the morning. If I get off to a good start early, I can keep going until about 5pm but I can never work in the evening. What’s in your current sketchbook? My present sketchbook has become a great unwieldy heap of drawings, photos and notes on scraps of paper, all of which relate to my present obsession of light seen through trees. If you had to choose between using a pen or a pencil to draw with – which one and why? 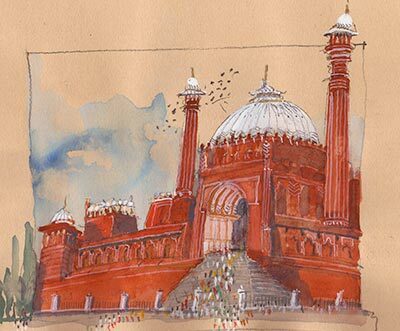 I prefer pen to pencil and particularly like water soluble ink pens with watercolour paper. I like to draw quickly, add some water, and when it is dry work back into the drawing with pen. One of the by-products of creativity is the ability to see things in a different way and to present new ideas in a way that no one has seen before, as well as highlighting beauty and the expression of human emotions. In some cases, artists are in a position to reach multitudes of people by using their status to bring attention to a worthwhile cause or environmental issue. 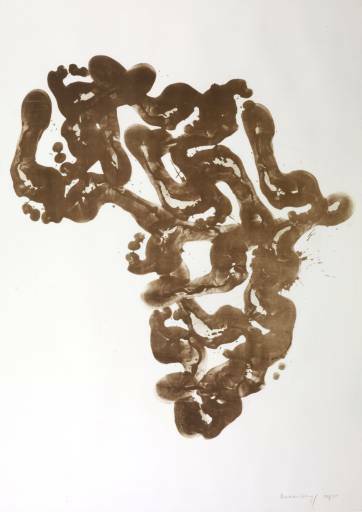 For example, Richard Long’s Africa Mud Maps, which Long has made for auctions and whose proceeds have contributed to aid for the developing world. One of the most interesting things that artists can do is spur public conversation and in future I may find that I am able to draw attention to endangered species or threatened habitat through my own work. I am currently working on a collaborative print project with another printmaker Emma Buckmaster, and our aim is to produce a series of tree portrait etchings on related leaves. Thank you Janet for sharing a little of your creative world with the Artworks blog! 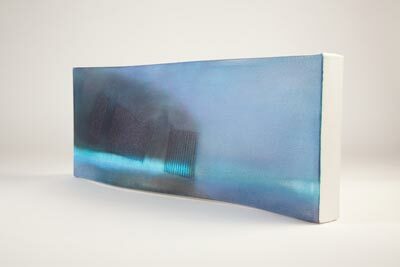 Janet French has a BA (Hons) in Fine Art from Colchester School of Art. In addition to Artworks, Janet is currently Joint Chairperson of Gainsborough’s House Print Workshop, and is a member of the Essex Art Society and the collaborative artist group Nine Artists. Originally from London, Janet French has lived in Essex for twenty five years. 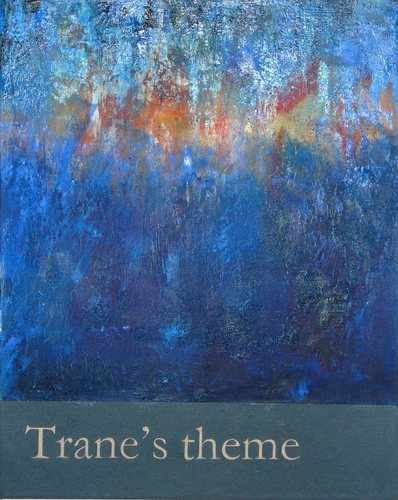 You can read more about Janet’s environmental artworks on her Artworks artist page and on her personal website. 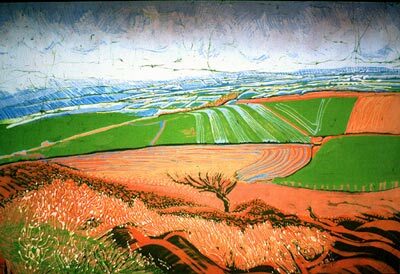 This entry was posted in artworks news and tagged artist interviews, artists, artworks, east anglia, exhibition, janet french, original prints, printmaker on June 11, 2011 by admin. Firstly, Helen tells us a little about what inspires her as an artist and how she makes her batik paintings. I have always been interested in landscape in all its diversity, after my childhood in Wales and now living in Suffolk, but also the visible effects that man has made, negatively and positively, on the landscape. Expressing “a sense of place” and my reaction to it is important to me. 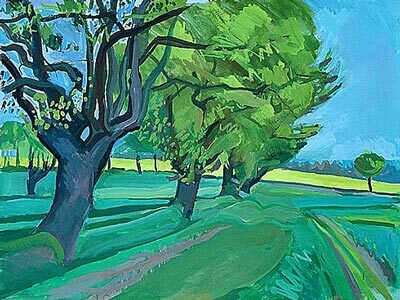 I paint and draw directly from observation, in an effort to capture the complete essence of landscape. My drawings and paintings, mainly in gouache or aquarelle pastel are always done on the spot. These media have an immediacy which enables me to express my interest in space and colour. 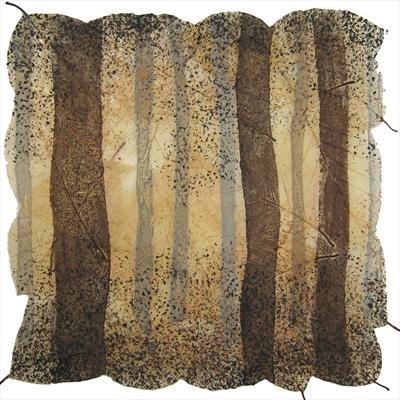 These ideas also have a particular affinity with the craft of batik, in the way molten wax can be painted or drawn across dyed fabric to produce textural effects. To make a batik painting, selected areas of fabric are blocked out with molten wax and then the fabric is dyed. The waxed areas resist the dye, while un-waxed areas absorb the dye. The process of waxing and dyeing is repeated by waxing or blocking out areas on the dyed fabric after it has dried, then dyeing it a different colour. Because dyes are transparent, the second colour is changed by the first colour e.g. a blue over yellow will produce green. Some of my batiks are immersed up to seven or eight times, usually starting with the lightest colour and progressing through medium tones, finishing with the darkest colours. 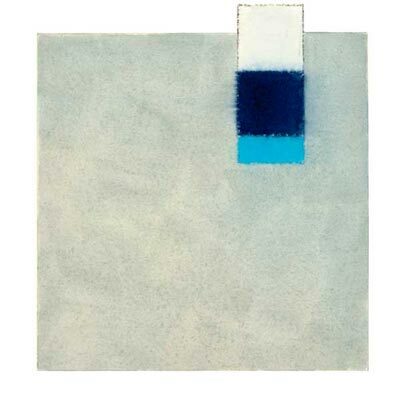 A particular effect of successive dyeing is the harmonious, layered combination of colours, i.e. apart from the first colour all the following ones are combinations of all the preceding colours. Another effect is the emergence of fine hair-lines within the design, caused by the wax cracking in the dye bath, or it is deliberately “crunched” to produce a subtle “crackle” effect. Sometimes the dyes are selectively painted on rather than immersing the whole fabric in the dye bath. After the final dyeing the wax is later removed from the fabric by ironing & blotting between sheets of newsprint to reveal the final design. 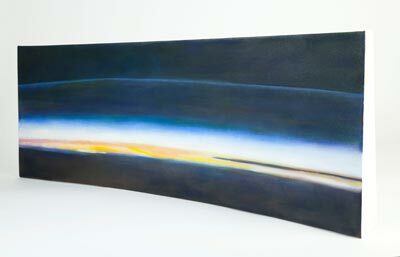 The piece is then dry-cleaned, washed, dried and mounted on a frame much like a canvas. 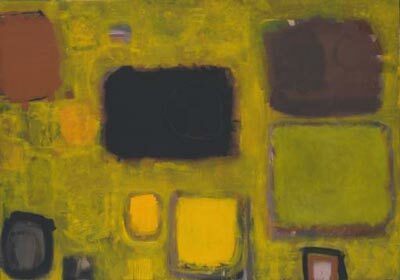 An awareness and sense of colour is obviously very important to you as an artist. What is your favourite colour & why? A bluey-greyey-green, the colour of the sea on the west Wales coast. The Cardiganshire and Pembrokeshire coast are very inspiring locations in addition to the landscape of East Anglia. 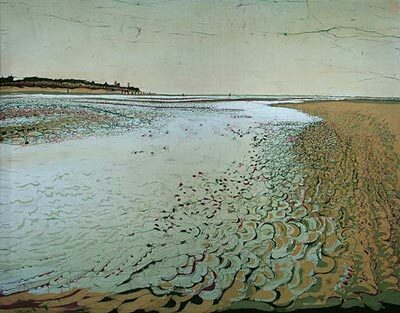 I am particularly interested in the effect of sunlight across stubble fields, or seascapes with wet, shiny undulating beaches or multicoloured shingle. So, for someone completely new to your art, how would describe it in just a few simple words? 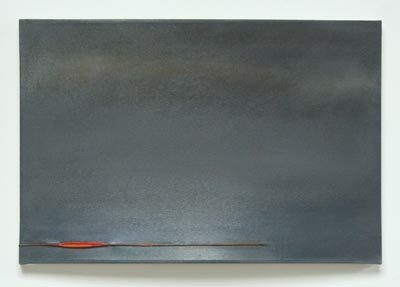 Subtle, colourful, textural, feeling, atmospheric, and ‘landscape’ is a word I use quite a lot in reference to my work. It sounds corny, but I need to be creative. So, how do you generate or develop the ideas for your work? Lots of drawing from observation, taking photographs and improvising, with different visual ideas. Could you describe your studio space/set-up. My studio is a converted farm building, a cart shed adjoining an old stable and barn, it’s long and low and it faces south, so we put in a north-facing roof-light, and it looks out onto a secluded garden. Your studio sounds wonderful! What’s a typical working day for you as an artist? The morning is mostly devoted to domestic chores, paperwork and e-mails, sometimes dog-walking and looking out for places that are interesting to draw. Afternoon and sometimes evening, is when I retreat to my studio, or if the weather is good, I go out with my easel and paints. If I’m working in batik, after spending a long time painting and drawing wax on cloth, I soak the whole piece in dye. While it is drying, and before I can continue with it, I might go and hoe a row of carrots! 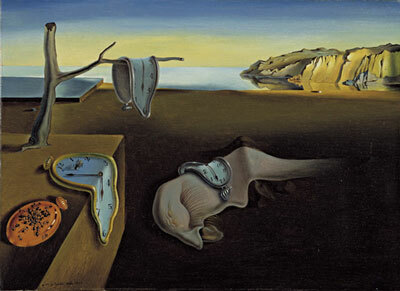 What time in the day are you at your most creative, do you think? Around mid afternoon. And, what do you listen to while creating? I listen to the radio and classical or jazz music. Would you care to share what’s in your current sketchbook? Drawings of raised furrows across a field where I think onions have been planted. 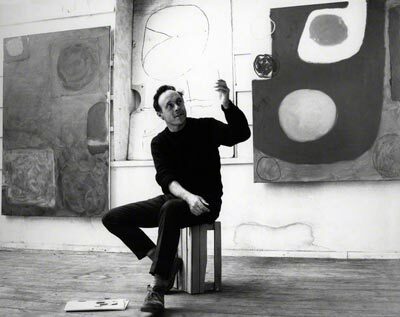 Howard Hodgkin. 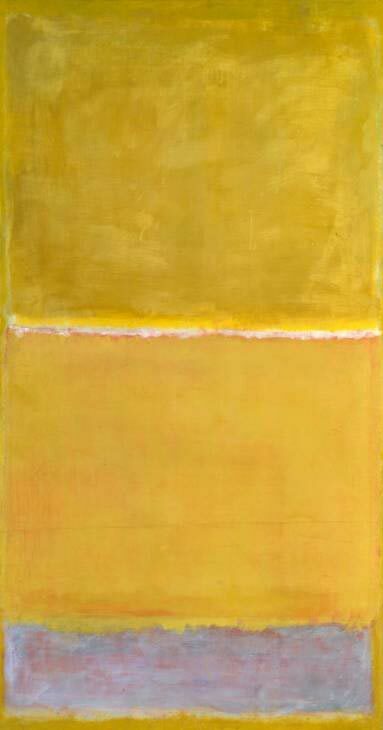 Fantastic colour and being able to describe a feeling or place in abstract terms with such an economy of incredibly sensitive brushstrokes. 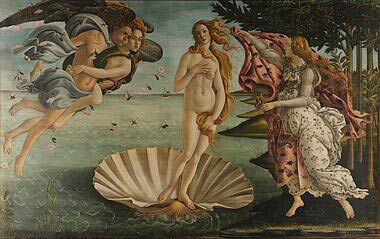 So, that leads nicely to the question, which famous artwork would you most like to own, if money & space was not an issue? 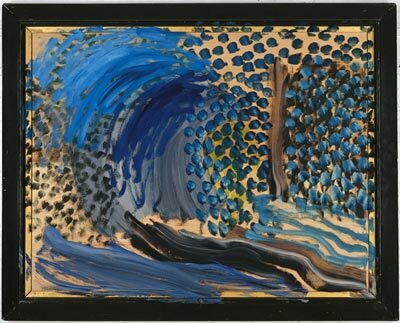 One of Howard Hodgkin’s paintings, possibly ‘Blue Remembered Hills’. 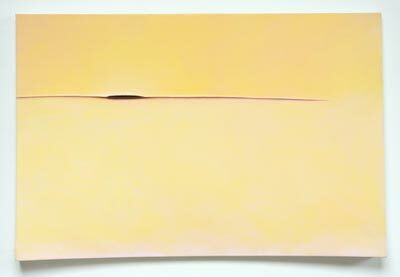 Could you name one work of art (contemporary or historical) that you don’t like – and why? 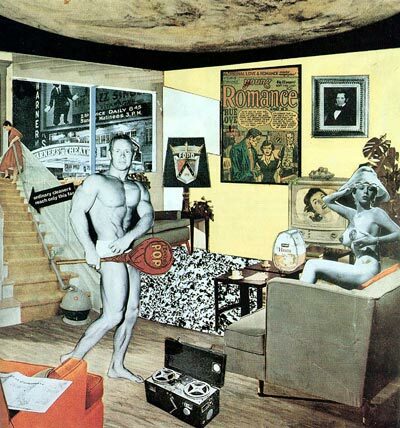 Richard Hamilton’s ‘Just what is it that makes today’s homes so different, so appealing?‘. It describes an age I was trying to move away from, it makes me cringe – so I suppose it was effective in its intentions! 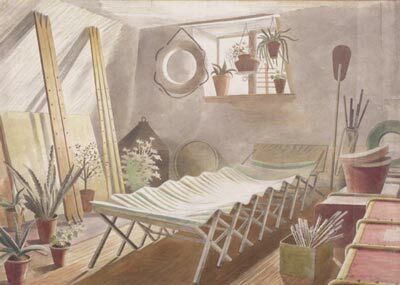 Nostalgia, such as looking at Eric Ravilious’s watercolour, ‘An Attic Bedroom‘, the camp bed in a bare-boarded, cluttered room; it reminds me of childhood summer holidays. Which artist (dead or living) would you fancifully like to invite to dinner and what question/s would you ask them? 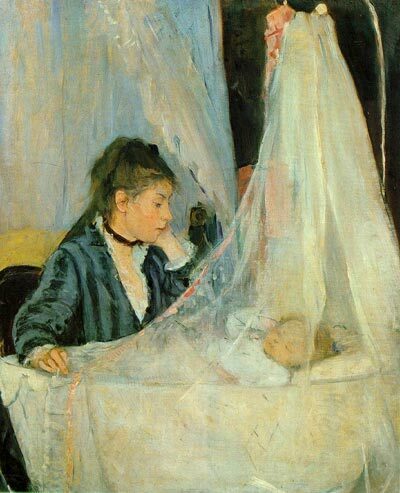 Berthe Morisot. What was it like being almost the only woman painter (of note), surrounded by so many men painters at the end of the nineteenth century in France? Also, what was her attitude to motherhood after her painting of ‘The Cradle‘ ? That’s a very interesting point regarding female artists in society. What do you think is the role of an artist in today’s society? To reflect good and bad things; I tend to go for the aesthetic. Students of art might be reading this with great interest, so what single piece of advice would you give them to make it as an artist? Keep following your hunches and learn many hand-skills, drawing, painting, printmaking, working in 3D, as many techniques as possible because art schools have tended to offer fewer in recent years. And lastly, what is your personal motto (if you have one)? Get something done each day, however insignificant. Thank you Helen, for a small glimpse into your creative world, and that’s a very good note to end on! I am sure our readers will be inspired. 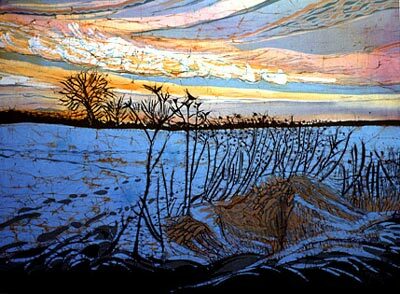 There is clearly a lot of time & skill involved in Helen’s incredibly detailed batik paintings and she explains the many stages of creating one her batiks, ‘The Snow Field‘ (shown above), on her own website. Helen also runs short courses in batik techniques; further details can also be found on Helen Dougall’s website. Helen Dougall studied fine art at Chelsea School of Art and then trained as an art teacher. 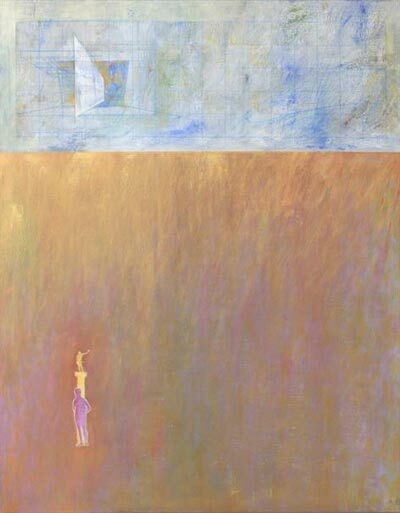 She taught in London and then Suffolk for many years, pursuing her own art full-time from 1997. 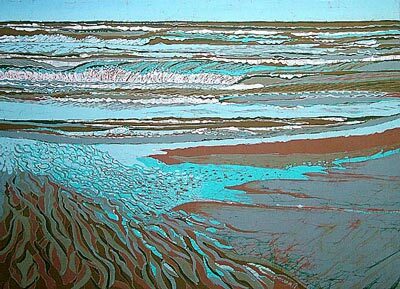 Helen is a member of the Batik Guild, the Suffolk Craft Society and Artworks. 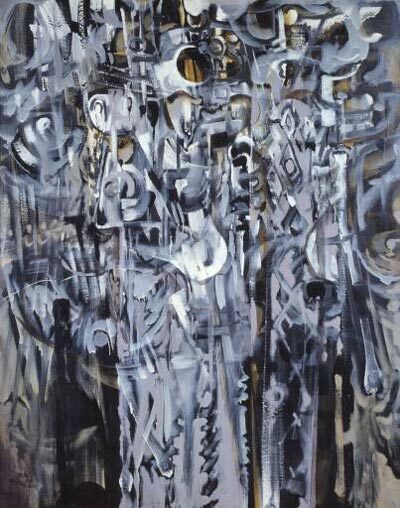 This entry was posted in artworks news and tagged artist interviews, artists, artworks, batik, east anglia, exhibition, helen dougall, landscapes, paintings, suffolk on April 28, 2011 by admin. Doug Patterson is a renowned archtitect & artist who, in his own words, says his feet have not touched the ground in the last six years! 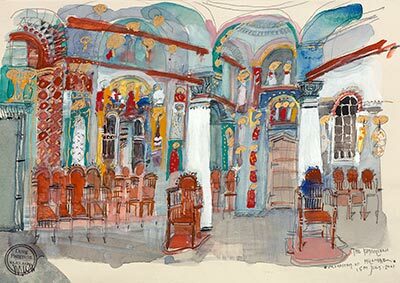 Over the last six years Doug Patterson has been on a personal artistic crusade, retracing the journeys made by three 18th and 19th century travelling artists – Hercules Brabazon Brabazon, Vasileios Gregorovic Barsky & Samuel Davis – who between them recorded the three great world faiths – Islam, Buddhism and Orthodox Christianity. The first location in this project was the Mahabodhi Temple in Bodhgaya, India. 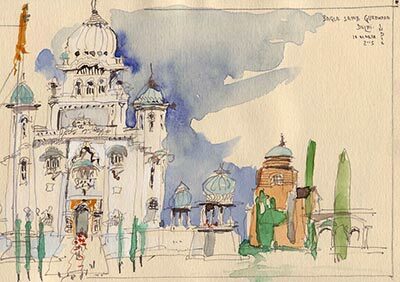 The journey was by boat from Calcutta via the Hooghly and Ganges Rivers, first to New Farraka and then through the lock onto the River Ganges. We finally docked in Patna then went by road to Bodhgaya, finally to arrive at the most sacred Buddhist site, the Mahabodhi Temple, culminating in an intense spiritual experience. The various artworks illustrating this particular journey are now almost complete. In November 2010 I then travelled to Albania to teach in the school of architecture and then I went on to Libya for Christmas and the New Year. This trip, first to Tripoli to visit Leptis Magna and Sabrata was astonishing, then on to Bengazi, and finally travelling 600km south through the Libyan desert to Gadhameson on the border of Algeria. My next Sacred Place is an expedition for one month through the Canyons in Arizona, I will be travelling with an artist friend who lives in Flagstaff, we will walk and camp through Bryce, Zion, Grand Canyon and Monument Valley – the latter is the sacred place, and the journey is the Canyons. Later in the year I am planning another journey (depending on current political events) to Yemen and Saudi Arabia, travelling overland from Aden to Sana and then to Riyadh. 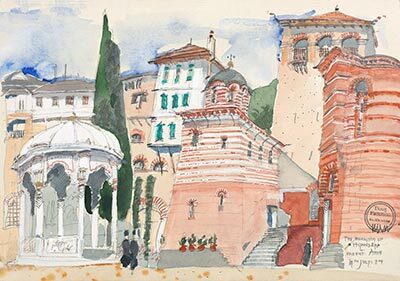 This journey, which follows the ancient Frankincense trade route between Yeman and Saudi Arabia, will include initial studies in watercolors (and then later as oil paintings in my studio) of the traditional architecture and mosques. My route will take in Aden via Tarrin, Kawkaban, Sana and the Wadi Dhahr Valley in Yemen, then crossing over into Saudi Arabia via Najran, Abha, Jeddah, Medina and Riyadh. 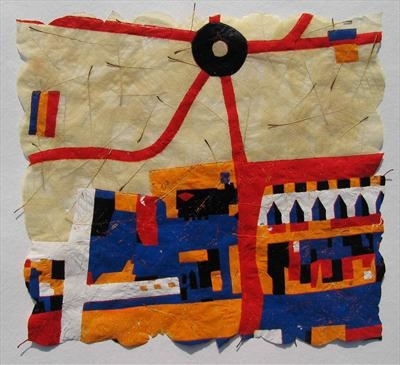 Artworks wishes Doug yet another ‘bon voyage’ and we look forward to the seeing the new ‘Sacred Places’ series as it evolves. In the meantime you can listen to Doug Patterson talking about the ideas & inspiration of his earlier travels on BBC Radio 4’s travel programme, Excess Baggage. This entry was posted in artworks news and tagged artist interviews, artists, artworks, doug patterson, exhibition, landscapes, paintings, watercolours on April 25, 2011 by admin.